Heat oil in a pan or dutch oven over medium heat. Add onion and cook until soft, 6-10 minutes. Add garlic and cumin; cook for 30 seconds, stirring constantly. Stir in tomatoes with juices, broth, and pumpkin; mix until smooth. Next, add chili powder, cayenne, oregano and beans. Once all mixed together take about half of the mixture out and put it into a blender and blend until smooth, return to pan. **You can blend more or less depending on how smooth you want your chili. You may also use an immersion blender if you have one! ** Chili will be thick. Bring to a boil, reduce heat, and simmer, partly covered, for 15-20 minutes. While the chili simmers, heat a small skillet over medium-low heat and toast pumpkin seeds until they begin to brown and pop, 3-5 minutes, making sure to shake pan frequently to avoid burning. 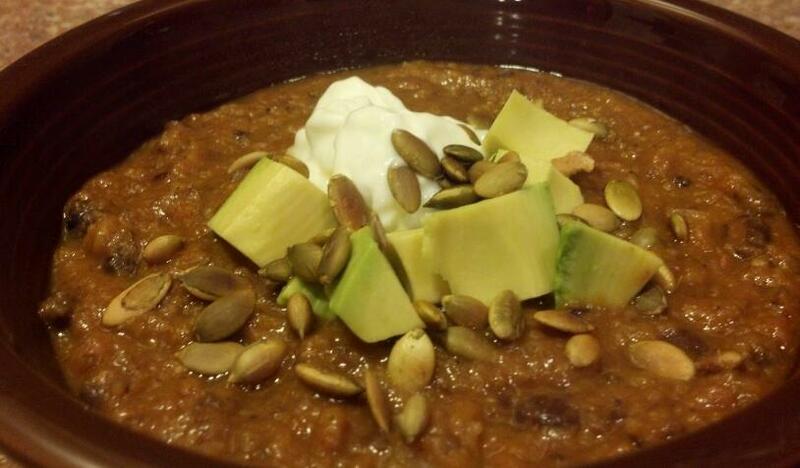 Serve chili hot, topped with sour cream or yogurt, pumpkin seeds, avocado, and cilantro.